A preclinical animal study, Clinical-grade stem cell–derived retinal pigment epithelium patch rescues retinal degeneration in rodents and pigs, funded by the National Eye Institute Intramural Research Program and the National Institute of Health Common Fund Therapeutic Challenge Award, published their results in the January 16, 2019 edition of Science Translational Medicine (STM). The researchers were able to prevent blindness in animal models of geographic atrophy which is the advanced form of dry age-related macular degeneration. Taking a patient's own blood cells, researchers were able to convert the blood cells into induced pluripotent stem cells (iPSC). This type of stem cell can then be "induced" to become any type of cell. 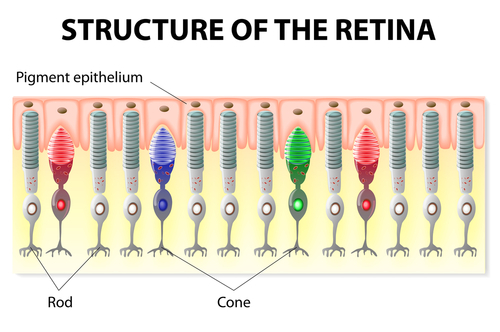 By programming the stem cells to become retinal pigment epithelial (RPE) cells and transplanting the patch of lab grown healthy RPE cells between the patient's RPE and photoreceptors, the layer of photoreceptor cells can now be supported to prevent any further death of the rods and cones. Since the patient's own blood cells are used, the chance of rejection of the RPE transplant is minimized. "The planning of a Phase I clinical trial testing the safety of the iPSC-based therapy for geographic atrophy is underway and will be initiated after U.S. Food and Drug Administration approval," reports the January 16, 2019 National Institutes of Health press release.